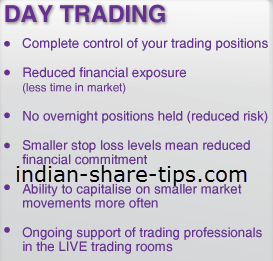 We have a habit of glorifying the developed nations and here being in India as a day trader is a boon when compared with USA. We in India do not worry about the minimum balance in account and can even start with Rs 10,000 to make upto Rs 1500 daily using the margin money courtesy our intraday tip whereas in USA one requires minimum $25,000 i.e. equivalent to 17 Lac and moment it drops below that one needs to fund the account. So, as a trader in India; you are blessed as you are able to get the margin money which has reduced the divide between the rich and poor as none can't say that he did not have enough capital to get started in the market.